April | 2012 | Occupy, Catholics! Tomorrow is May Day. Tomorrow is May Day! There will be Occupy actions in more than 100 places around the country, and we hope to have an Occupy Catholics presence at as many of them as possible — the movement needs us. Please, wherever you are, share your May Day stories and photos by posting to the Occupy Catholics Facebook page or by tweeting to @OccupyCatholic. You can also email longer Testimonies to occupycatholic@gmail.com for the occupycatholics.org website. We can’t wait to spread the word about what you’re up to! • 9 am: Foot-washing at Bryant Park. Meet at the fountain at 6th Avenue and 41st Street to help us offer this act of biblical mutual aid. We’ll also be offering free socks for those who need them. If you can, bring socks to give away! • 2 pm: March to Union Square. 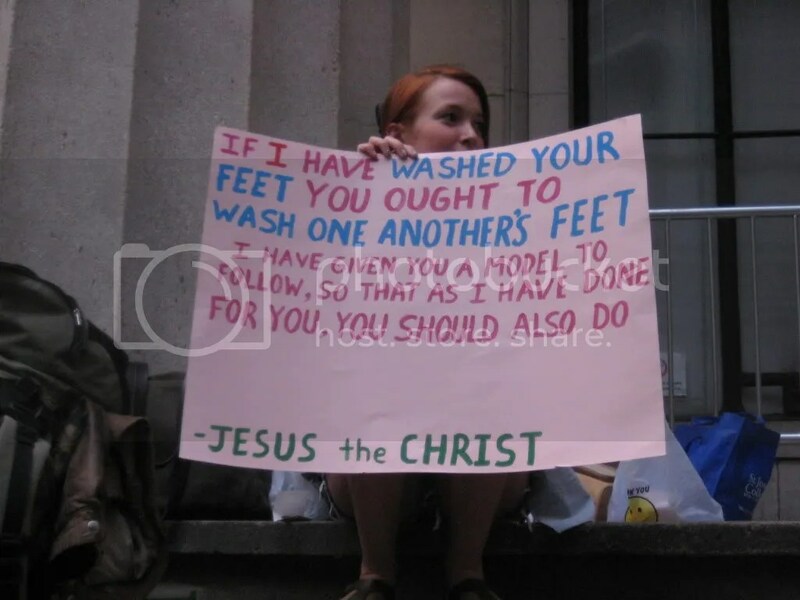 After foot-washing, we’ll join the unpermitted OWS march down to Union Square, where a coalition of unions, immigrants’ groups, and community organizations will be rallying. • 4 pm: Meet up with Occupy Faith. At the Gandhi statue on the southwest corner of Union Square, we’ll join with others from Occupy Faith in fellowship and solidarity. • 5:30 pm: March to Wall Street. Together with Occupy Faith, we’ll take part in the permitted march from Union Square to Wall Street. New Yorkers, dress for possible rain. If any plans change, check @OccupyCatholic for updates. See a complete list of May Day events here. We’ll see you in the streets. The Occupy movement has been largely a white, urban phenomenon, and one with a bit of a tendency toward vanguardism, which makes it not entirely surprising that it’s often blind to the fact that there is no force more potentially revolutionary in U.S. history or in the country today than religion. But the movement remains oblivious to this fact at its own peril. You who are blind, see. On the other side of the Atlantic, left intellectuals have been starting to discover what they have to learn from religion about revolution. Slavoj Zizek, Alain Badiou, and Giorgio Agamben have all written about the apostle Paul in recent years: he stood at the intersection of Judaism and Christianity and was the architect of an underground movement that eventually subsumed the Roman Empire. During the early days on Liberty Plaza, actually, I felt like I was witnessing a glimpse of how Paul described his early church: the holding of all things in common, a single-minded asceticism, and local cells miraculously spreading throughout the known world. Living in societies far less religious than ours, thinkers on the European left are realizing that the loss of religious imagination can mean losing the capacity to imagine and take steps toward a radically different kind of society. It’s hard to think of anyplace where religion’s revolutionary potential has been more fully realized than the United States—both for good and for evil. Many activists nowadays assume the completely non-empirical notion that religion in this country today is a wholly owned subsidiary of the Republican Party. But this impression is the result of a very temporary and partial—if singularly effective—alliance forged at the onset of the Reagan era. This alliance need not last. American religion is nothing if not finicky with regard to politics, and highly troublesome to those in power. The colonial impulse itself, of course, originated among Puritan congregationalists—utopians who sought to create autonomous communities apart from monarchs. This impulse, further radicalized, gave us the concept of religious liberty and the legal right to free thought. In the decades before independence, anti-imperialist ideas spread through the revivals of the First Great Awakening. Quakers, working in leaderless and consensus-based communities, resisted conscription and oath-taking at the behest of the state; in the mid-19th century, they also led the crusade to abolish slavery. Facing discrimination and lack of access to services, Catholic immigrants created a whole system of parallel schools, hospitals, and charities. The Northeast of the 19th century was dotted with off-the-grid communes and experimental lifestyles, run according to the dictates of various religious and spiritualist sects; it was from these that we get Americanisms from Shaker furniture to Graham Crackers. The insurrectionary and separatist Mormons emerged from this milieu as well, until being driven westward to found their socialist Zion in the desert, which they defended from the feds by force of arms. These are not the exceptions of American religion; inventiveness, suspicion of authority, and autonomy are really right in the mainstream, however cleverly disguised for the sake of bourgeois decency. Want to see mutual aid? Look no further than the nearest suburban, nondenominational megachurch, where members find free day care, credit unions, employment services, good works for the poor, support in times of crisis, and access to a political machine. While these political machines have tended of late to be co-opted by the 1 percent, in the past they were engines that helped drive (as well as suppress) the early labor movement, and women’s suffrage, together with just about every other political movement with any major impact on American history. And how could it not? About 14 million people belong to labor unions in the United States; closer to 120 million attend religious services regularly. Most of them, at least some of the time, are told in those services to do good, seek justice, and rescue the oppressed. Whether it’s on behalf of affordable housing or the unborn, or for an end to AIDS and human trafficking, religion represents an enormous proportion of how people in this country organize. The Occupy movement has already caught some of the bounty that faith-based organizing has to offer. Before and especially after last fall’s wave of evictions, Occupiers have met, slept, and eaten in houses of worship. Religious communities possess tremendous quantities of real estate, no small amount of it unused. Such spaces could become available to the movement, and by means more diplomatic than the failed, forced occupations of church property tried in New York and, most recently, San Francisco. Far preferable, I would think, are Occupiers’ successes in defending from closure an historic black church in Atlanta and a Catholic homeless center in Providence. Meanwhile, for a movement that has still failed to bring eviction-defense and anti-foreclosure action to a mass scale, religious groups provide the ideal platform for doing so; equip them with the right tools and strategies, and when some of their own are threatened by the banks, their fellow faithful will rally to save their homes—not merely on the basis of political ideology, but with the far more powerful motivation of looking out for the community. This kind of action also has special resonance in religious traditions, from the debt-forgiving Jubilee of the Hebrew scriptures, to the radical aid for those in need taught and practiced by Jesus Christ, to the ban on usury in Islamic law. An act may be civil disobedience by temporal standards, but to a higher law, resisting oppression is a basic requirement. One need only think of the civil rights movement, arguably the last mass resistance movement in the U.S. to win decisive political gains. 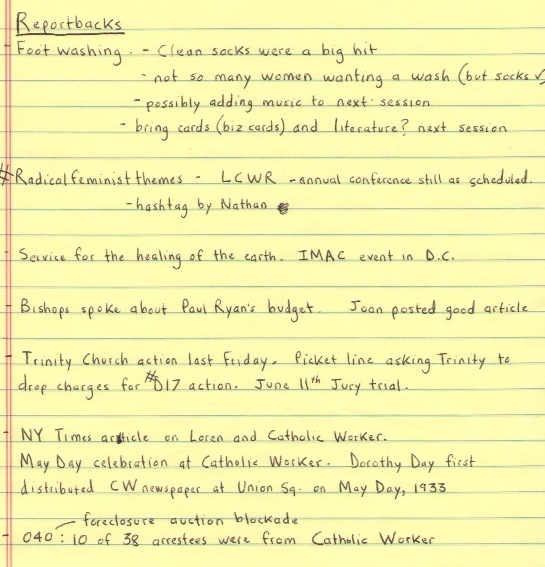 In it, churches were often the basic units of organizing. Clergy locked arms with activists at the front lines, and together they won. The tryst between civil rights and churches, however, was not always a happy one. Southern clergy, both black and white, had learned to benefit from segregation, and a new civil rights organizer in town could represent a threat to their privileges. Saul Alinsky claimed that he never got anywhere appealing to clergy by the precepts of their faith. “Instead,” he wrote, “I approach them on the basis of their own self-interest, the welfare of their Church, even its physical property.” An eminent religion reporter I know says he deals with them like he used to deal with the mob. The clergy-driven Occupy Faith network has been created to be an interface between the leaderless movement and the needs of professional religious leaders. 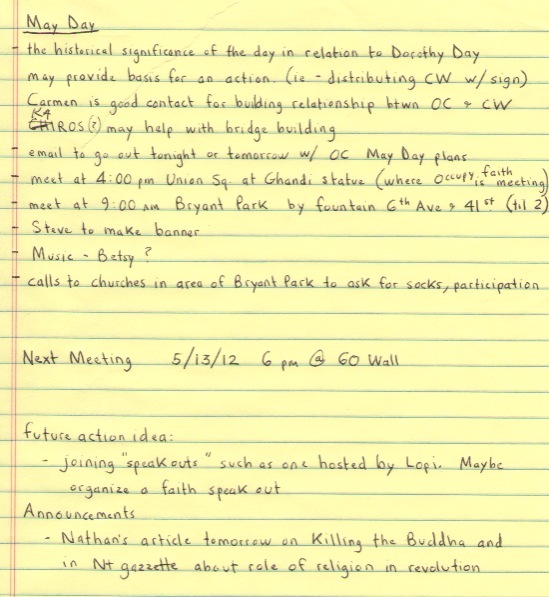 It’s not an easy task, Occupy Faith’s organizers realize, but it needs to be done. The alliance between churches and civil rights ultimately worked because courageous people made clear that it had to. While most religious communities don’t come anywhere near the Occupy standard for horizontality and transparency—nor does Occupy, for that matter—they’re not as bad as an outsider might think. The flock often finds plenty of ways of scaring the shepherd—from the power of the pocketbook, to steering committees and boards, to the threat of simply picking up and going elsewhere. That’s why, as with unions, Occupy isn’t going to get anywhere with religious communities until it wins over the rank-and-file. Then, leaders will have to show support for the movement, or else. As I stood waiting for the action against Trinity Church to begin on December 17, I struck up a conversation with a man in a Roman collar and a black beret, Fr. Paul Mayer—a formerly married Catholic priest and veteran of every major American social justice movement since he marched with Martin Luther King, Jr., in the 1960s. Trinity is an Episcopal church; I asked him what he thought Catholics would do if OWS were making a demand like this of us. “We’d be worse,” he replied. I didn’t know it at the time, but, together with Episcopal Bishop George Packard and Sr. Susan Wilcox, a Catholic nun, Mayer was about to lead the charge over the fence, down onto Trinity property, and promptly into police custody. The following night, out of jail, he and Wilcox joined me and a lapsed cradle Catholic, a theologian, and a sociology student for the first meeting of Occupy Catholics at a bar near Zuccotti Park. We came together with a common but still not quite clarified desire to create an affinity group of Catholics involved with the movement, as well as to take what the movement was teaching us and bring it to our church. Maybe, someday, we could help Catholic churches respond better to Occupiers than Trinity did, and vise versa. So far our emphasis has been on reaching out to laypeople, online and through the social justice ministries of nearby churches. We’ve held a general assembly at Maryhouse Catholic Worker, part of the organization Dorothy Day co-founded with Christian anarchist principles to serve the poor and struggle for justice and peace. For months we’ve been slowly growing, planning, and praying about how to lead our church, the biggest landowner in New York City, to join Occupy’s call for a more righteous society. We’ve been teaching Catholics about the movement and Occupiers about the long and deep Catholic social justice tradition. We got this group going because the connection between Occupy and our faith was so obvious we couldn’t ignore it. We needed this movement, and we know that the movement no less needs us. This past Good Friday, the most solemn day of the Christian year, we stood in front of St. Patrick’s Cathedral and sang, “Were you there when they crucified the poor?” against the bishops’ silence on a budget in Congress poised to slash services upon which the 99 percent depends. “We love our church,” we cried with the people’s mic, “and right now the church needs to speak.” So we did. Maybe next time we go to St. Patrick’s, we’ll be sleeping on the sidewalk. By Nathan Schneider, from Killing the Buddha. A version of this article appears in n+1‘s Occupy! The OWS-Inspired Gazette issue 4. Loren Hart, a member of the Catholic Worker Movement, on Thursday. Marcus Yam for The New York Times. 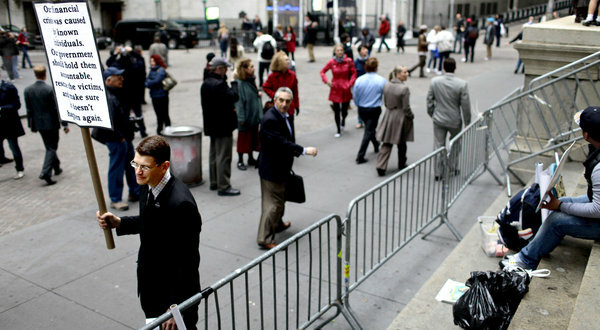 On Tuesday afternoon, on the steps of Federal Hall, in Lower Manhattan, where Occupy Wall Street protesters have been contained in recent weeks, Loren Hart, a conservatively dressed man of 33, sat reading a newspaper as he held a sign that gave quiet expression to pervasive grievances: “The economy is failing us. Our climate is worsening every day. Perhaps we should make some serious changes.” Mr. Hart arrived in New York from North Carolina in October to join the Occupy movement with the expectation that he would stay a few days, but he has felt unmotivated to leave. Issue-specific protests are now so ubiquitous on the menu of New York experience that Mr. Hart has had plenty to do since the police cleared Zuccotti Park of demonstrators in November. Last week had him rallying in Union Square to denounce the rise of student debt. Several days earlier he was arrested at the Brooklyn Supreme Court for participating in an action organized in part by Karen Gargamelli, a Queens housing lawyer who sought to disrupt foreclosure auctions by gathering demonstrators to sing during them. Two weeks ago, 63 arrests were made in a series of these disturbances around the city (which take place under the banner Organizing for Occupation), and many of those hauled off were, like Mr. Hart and Ms. Gargamelli, members of the Catholic Worker Movement. The movement has always sought “a new society in the shell of the old” — peace, less disparity of wealth, an end to economic exploitation, violence, racism and so on. Its goals can seem broad but its methods are intimate and practical. Around the country and in various parts of the world, Catholic Worker communities exist as households where lay members, typically committed to voluntary poverty, often live among the homeless and needy they are aiding. It is a model for Occupy Wall Street — like that more recent movement, it is decentralized and decisions are largely made by consensus — which has said it will hold protests around the country on Tuesday, historically a significant day for the labor movement. There are no headquarters or board of directors and, since Day’s death in 1980, no leader. Things have hardly faded: in the past 17 years, the number of communities has grown from 134 to more than 210. The oldest of these is in New York —in two buildings in the East Village, one primarily for men, the other for women — and a visit there offers lessons in the kind of radical empathy we rarely get to witness. Mr. Hart lives among 25 or so mostly homeless men at the St. Joseph House on East First Street. Every Friday he cooks for the 80 to 200 nonresidents who show up each weekday for a midmorning meal. What I witnessed next was probably the most moving thing I’ve seen yet. I was standing maybe 20 ft off to side of the only entryway to the barricaded area with two others who I had just met. Earlier I had noticed in the crowd a woman who had Occupy Catholics band draped around over her shoulders that hung down on either side of her. 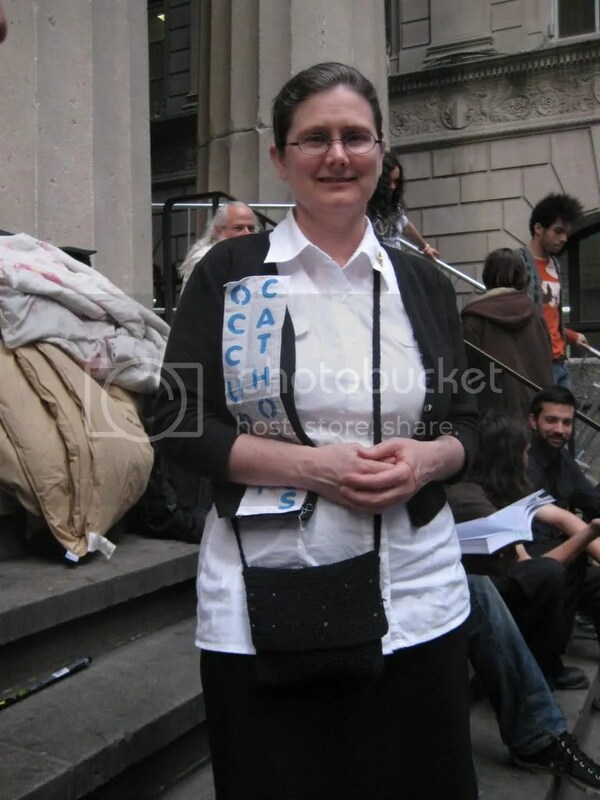 We had suggested to a Spanish woman who appeared lost on the sidewalk saying she was looking for Occupy Faith that she might be able to find out something from her. The Occupy Catholics woman and another woman were holding signs referencing Bible scripture. They were standing near the entryway when a slightly disheveled-looking but buoyant fellow came up remarking how different the place looked at that moment and walked inside where he was greeted by others. The person I was standing with thought he had just been released from jail, and smiled that he probably came right back to join the protesters. “Would you like your feet washed?” asked another protester. The gateway area was generally where people were congregating; things were left around there, nearby food had been brought in to feed people. It wasn’t a visible spot and you couldn’t really make out what was happening unless you were right there, yet here was one of the most humbling, compassionate and graceful acts I’d ever seen in public. Up the twenty or so steps and all around inside the barricaded area were lots of colorful people, and the crowds had begun to thin and pass by. This submissive act of abasement, a manifestation of Christ performing the slave-like duty of washing the master’s feet as a gesture of love toward his disciples and a reminder they were in service to each other, wasn’t witnessed by many in the streets there. It struck me like a thunderbolt. I immediately thought of Thomas Merton, the poetic Trappist Monk who authored one of my favorite books “Seven Storey Mountain,” and how reflective it was of his writing. I thought to myself, at that very same moment that there was a very good chance right around the block a businessman in suit and tie was having his shoes shined. A metaphor escapes me now. Much in the same way a broker getting his shoes shined could never imagine degrading himself thusly, or show any kind of weakness or humility, in the same way many on the sidelines avoid OWS because it is a direct challenge to their conscience. Food was being served for the protesters, organic hemp hats had arrived and were distributed. A rare sense of community, sharing and taking care of one another, which is at the core of this movement, was ever more present. The amount of support OWS gets from religious leaders doesn’t get much reported in the media. Yet there have been signs of it everywhere since the very beginning. I can think of many instances of having seen and talked with priests, ministers, rabbis and monks, finding stacks of the Catholic Worker (with a front page endorsement) at Zuccotti Park. I remember a Long Island priest holding a protest sign who remarked that he was wearing his collar because he was indeed doing ministry work standing with the protesters. The many churches who have donated to the Occupy movement, most prominently Riverside providing tents for the protesters, and Judson Memorial opening its doors to offer sanctuary to the displaced right after the eviction, remind us of the true mission of those institutions. And according to a symposium called “Occupy the Mind: Progressive Moral Agenda for the 21st Century” with by Cornel West, Union Theological Seminary President Rev. Dr. Serene Jones, Editor of Tikkun Rabbi Michael Lerner, and Senior Riverside Church Minister Rev. Stephen H. Phelp, the Occupy movement represents the “true revolution of values” King sought. I was one of those who was educated in the post-Vatican II era, when there were yes, guitars (I’m running a one-woman campaign to bring back the Folk Mass in its glory), and also—dare I say it—progressive ideas kicking around parishes and high schools. I actually took a class in high school called “Christian Woman,” which had a text, I remember quite clearly, called Christian Feminism. At the time, I was just glad to not be in the dreaded Adult Christian Living any more (see more about this here) but I have to admit, “Christian Woman” had quite an impact on me, as loathsome and eye-rolling as I found it at the time. There’s a reason why feminism is quashed, belittled, said to mock God himself. It’s nothing less than the notion that women, despite our “sexiness” (allegedly so much more than men) and procreative powers, are actually just people. That’s right. Humans. I daresay Jesus was on board with that too. I recently saw a story about a group of young seminarians protesting outside an abortion clinic in full cassocks, looking quite dandy, merely praying. Classy move, I thought. Much better than shouting and waving pictures of pulped embryos. Who doesn’t like people in garb, anyway? It makes the world a little bit more magical. But I also had this thought:Wouldn’t it be beautiful if those young men escorted women to the clinic in their finery? Wouldn’t that be chivalrous? Christlike? Because the spectacle of harrassing women at abortion clinics has never seemed like anything to me other than kicking the vulnerable when they are down. Where is the compassion for the humans who are just trying to take care of themselves and their families? Recently, some nuns were reprimanded for doing this very thing. I believe these women are courageous and heroic, stepping into the breach to aid those most in need of comfort. The problem is that I might be considered a “radical feminist” but I don’t think that “feminism” is actually radical. In fact, I learned about it in Catholic school. I wouldn’t have had the courage to set off into the wilderness and become a writer had I not been exposed to these ideas. Therein, I suppose, lies the problem. I feel like a prototype that has been discontinued and expunged from the record. I tend to write a lot about nuns because I find so much inspiration there, not only as a woman. As a human. My heroines, who include Sister Corita, St. Therese, St. Teresa of Avila, Julian of Norwich, Hildegarde, Jeannine Deckers, Sr. Nancy Murray, Dolores Hart, and of course, all the wonderful nuns I have known and met in my life, show me now to live, how to love and how to think. Education of women, which the church has excelled at in America, is imperative to the progress of humanity. The problem for the patriarchy (yes) is that education of women leads to women having ideasabout being people. By Mary Valle. Originally published at Killing the Buddha. 8th Day Center for Justice has worked on economic issues since its founding in 1974. We have witnessed the ongoing struggles of communities made poor to claim a space in a cultural imagination and political discourse that is not shaped by the misconception that poverty is a choice. The U.S. Conference of Catholic Bishops (USCCB) is criticizing the House Republican budget authored by Rep. Paul Ryan for cutting food stamps and other assistance programs for the poor. Arrests and Jail On Wall St.
What is it about being arrested that evokes such deep and ambivalent feelings from most of us? Revulsion and fear from the majority and a different reaction, sometimes even attraction or the willingness to pay the price, from a few. What a fascinating conversation between these two friends. Perhaps reminiscent of the inner dialogue that some of us are having as we see young people being arrested at the Wall Street occupation. Some of us might also have been puzzled recently at over 1000 people, including older citizens, being arrested outside the White House over the Tar Sands continental XL Pipeline. How can anyone be so foolish as to tangle with the Law? And yet there is a tradition of nonviolent direct action reaching back to the Boston Tea Party, Dr. Martin Luther King, Jr., Mahatma Gandhi and even Jesus. This tradition continues today with people — especially our youth — willing to break a human law as a way of obeying a higher law of “justice for all” or the sanctity of the earth. In full disclosure, this writer admits to occasional arrests on behalf of social causes, most recently at the White House over the Tar Sands Pipeline, appealing to the President, who can single handedly stop this onslaught against the Earth. Some might ask why an 80-year-old priest should be involved in such senseless and undignified activity. For me the willingness to risk arrest is not like the moth flying into the flame. Rather it is an attempt by the powerless to communicate when all else has failed, to get the attention and perhaps even reach the conscience of the powerful through a seemingly extreme action. It might even evoke questions about those in the suites of high finance who have been guilty of the criminal activity that has caused this crisis and who will never feel the plastic cuffs on their manicured hands. And so the idealistic and determined young people of the Wall Street Occupation have decided that if the banks and corporations and those who they see as their protectors in the Congress and White House will not listen, then perhaps the people will. It is an act of hope rather than despair and those in power would do well to listen. For there are others of the suffering dispossessed and often unemployed majority, growing more desperate each day, waiting in the wings, who may not subscribe to such discipline and non violence. This article first appeared at The Huffington Post. These were the alternate words for the traditional spiritual “Were You There?” sung by Occupy Catholics at the action at St. Patrick’s Cathedral on Good Friday, April 6. Read more about the action here.